aati-online.org www.aati-online.org/lecce/ - American Association of Teachers of .. It is hosted by Allstream Corp (Ontario, Toronto,) using Microsoft-IIS/6 web server. 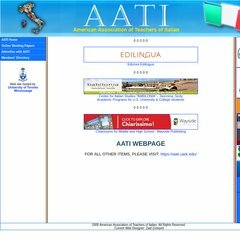 Aati-online.org's server IP number is 216.13.106.54. It has 4 nameservers, including dns1.nameresolvers.com, dns2.nameresolvers.com, and dns3.nameresolvers.com.